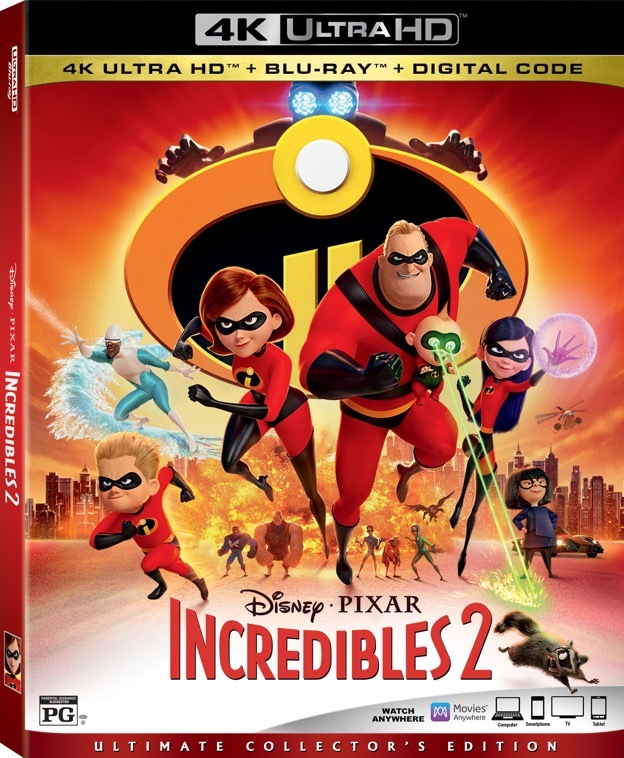 Incredibles 2 on Blu-ray and Digital Download! Incredibles 2 has just been released on blu-ray and digital download. The Incredibles has always been my favorite Pixar animated film and Incredibles 2 improved upon the formula from the first film. When Disney sent over my review copy, I plugged in the digital code and started enjoying the film on the Movie Anywhere app immediately. But let’s talk about all of the incredible extras and special features that are part of the blu-ray and digital download! The Coolest Guy in Show Business – In this partially illustrated documentary, Samuel L. Jackson reflects how his childhood and love of comics shaped his passion for film and imaginative storytelling. 2 SuperScene Breakdowns – Casual commentary-style pieces looking at specific scenes in the film (The Racoon Fight and Mrs. Incredible) through a particular creative focus like action choreography, set design or story. All-New “Auntie Edna” Mini-Movie – When Bob Parr visits super-suit designer Edna Mode looking for help with his high-energy toddler Jack-Jack, Edna pulls an all-nighter designing a suit to harness the baby’s seemingly limitless powers. 10 Deleted Scenes With Introductions – Suburban Escape, Kari Revisited, Return of the Supers, Chewed Out, Late Audition, Slow Day, Frozone and Honey, Restaurant Robbery, Fashion Show and Security Breakdown. Super Stuff – From buildings and vehicles to costumes and props, every action movie requires a lot of really cool stuff. Meet the makers and learn what it takes to design and build such a uniquely incredible world. Heroes & Villains – A collection of mini-docs about the backstory and major design ideas behind the “Incredibles 2” characters — featuring voice actors, director Brad Bird, and Pixar artists talking about the many elements that make these characters feel real. Strong Coffee: A Lesson in Animation with Brad Bird – Brad Bird’s passion for animation dates back to his childhood and mentorship under Disney’s Milt Kahl, and that enthusiasm and powerful insight emanates from every film he’s made. Take a deep dive into Brad’s early years at Disney Animation Studios and his time at Pixar. Paths to Pixar: Everyday Heroes – At its heart, “Incredibles 2” is about family dynamics and the challenges of being a working parent. Meet the parents of Pixar as they discuss their personal connections to the film and their experience with stretching to balance work and family. SuperBaby – A documentary/hip hop music video hybrid hosted by Frankie and Paige from Disney Channel’s Bizaardvark. This piece explores how Jack-Jack came to life onscreen — from design to special effects to animation — all set to a hot beat. Commentary – Get inside commentary from animators Alan Barillaro (supervising animator), Tony Fucile (supervising animator, story artist and character designer), Dave Mullins (supervising animator) and Bret Parker (animation second unit and crowds supervisor). Theatrical Short: “Bao” – An aging Chinese mom suffering from empty nest syndrome gets another chance at motherhood when one of her dumplings springs to life as a lively, giggly dumpling boy. Outtakes & Stories – Raccoon Fight Story, Evelyn Animation Outtakes, Puppet Animator Interview, Outtakes Goofy Arms Story and SuperBaby Music Video. Should You Buy Incredibles 2? The Incredibles 2 blu-ray and digital download offer some of the best special features content that I’ve experienced on a release in a long time. The “Auntie Edna” mini-movie was a stand-out, along with the Strong Coffee documentary about animation, Brad Bird and his history with the Disney Studios. Animation fans and stunts are going to be thrilled with the extras packed on this disc. Overall, Incredibles 2 is a superb addition to your collection, whether you’re purchasing the physical blu-ray or the digital download. Personally, I always opt for the package with the blu-ray and the digital copy so that I can enjoy the movie anywhere. FTC Disclosure: A copy was provided by the author for the purpose of this review. This post contains affiliate links, which means that ImagiNERDing receives a percentage of sales purchased through links on this site. Thank you for your support!